Oveta Culp Hobby was born in Killeen, Texas. She received her education at the Mary Hardin Baylor College for Women in Texas, and from the University of Texas Law School where she received a law degree in 1925. Immediately after graduation she became parliamentarian for the Texas House of Representatives, and Assistant City Attorney in Houston. In 1931 she married William P. Hobby, former Governor of Texas, and Publisher of the Houston Post. Following her marriage she helped her husband run the Post, until 1941, when Mrs. Hobby went to Washington, D.C. as a $1 a year executive, to head of the War Department's Women's Interest Section. From 1942 to 1945, she served as Director of the Women's Army Corps, and as a result of the success she achieved at this position, was awarded the Distinguished Service Medal. Following World War II, Mrs. Hobby returned to Houston to help her husband run the Post, and a newly acquired television station. 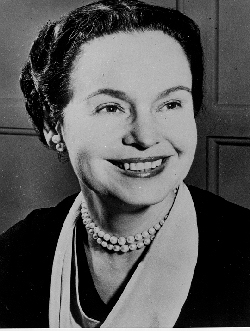 In 1953, President Dwight D. Eisenhower named her head of the Federal Security Agency, which, later that year, was elevated to a Cabinet position and renamed the Department of Health, Education, with Mrs. Hobby becoming its first Secretary, a position she held until 1955 when she resigned and returned to Houston to take care of her ailing husband.